I started suffering with rosacea 8 years ago; classical symptoms with red nose and cheeks. I carried on with my life as normal hoping the symptoms would disappear. I work for myself teaching in business and the condition can be embarrassing and misunderstood. One class assumed the condition was due to a drinking problem. They reported this and as a consequence I have never taught again for that organization. I started having symptoms of unusually high levels of bloating, and unable to put my rings on. I also noticed right-sided pain at times in my gallbladder area. I have been tired, and lately have been waking up at night with numbness and tingling in my arms. I have been taking multi-vitamins and vitamin D3 supplements, so I had no idea that I was potassium deficient. I finally went to the doctor after I was gaining weight rapidly, and my stomach looked like I was 5 months pregnant. I also noticed that my heart rate was much higher than normal throughout the day. I wear an Apple watch, and it monitors it frequently. After I went to the doctor, he thought my symptoms were due to irritable bowel syndrome. I got my blood work done, and it showed that my potassium was low and I had hypokalemia. I am still waiting to see how he will manage that, but I did find potassium supplements to take, and I will drink Smart water. Hopefully my doctor will find out what is causing the low potassium. I was diagnosed with rosacea 9 years ago. I have seen 3 different dermatologists in my quest to keep my skin clear, and still see two of those. Here are some therapies that have worked for me: Metrogel and Metrocream work for me to reduce papules and pustules. It's not so great for the background redness. Intense pulsed light (IPL) administered by the knowledgeable aesthetician at my dermatologist's office is very good at clearing rosacea for a month or two, but repeats are needed. Low dose Claravis (Accutane) 10 milligram capsule twice a week for a month or two has a very good clearance of itching, papules and pustule, and redness for me. If you have oily skin along with the rosacea, it will help with that also. Just got a couple of samples of Soolantra, the new topical ivermectin cream from my dermatologist. It is doing a super job clearing the acne-like lesions and the itching at the jawbone and on the face near my ears. Cliradex eyelid wipes containing the active ingredient in tea tree oil, 4-Terpineol, have worked wonders on my itchy blepharitis and meibomian gland dysfunction. I get them at my ophthalmologist's office. The wipes can also can folded over and used on the face. I've been using these on my eyelids and on my face before bed. Sodium sulfacetamide (10 percent) and sulfur (5 percent) facial wash for acne, rosacea, and/or seborrheic dermatitis works to clear your skin, without being too harsh. I use Calming Zinc cleansing bar when my skin gets too sensitive, I really like it. Naturally, I don't currently use all these products together! Currently, I use the Cliradex wipes about every other day at bedtime and the Soolantra applied sparingly during the day. I was just recently diagnosed with rosacea. I have never in my life had skin problems and my parents do not have this problem. Two days ago, the day of my dermatologist's appointment, I noticed my eye lid was slightly swollen and then the next day swollen worse! Three days later so swollen it was hard to see out of it. I am just wondering if anyone else with this rosacea has experimented this happening to them. I was diagnosed just today by my dermatologist. While I was there for something else, I mentioned that a woman my age (56) should not be getting acne. The doctor said I'm at the beginning stages of rosacea and prescribed metronidazole cream twice a day. Evidently, this could also explain the problems I've been having with my contact lenses lately. My eyes have been so dry I can't wear them most days. Wish me luck. For three years I've had rosacea on my cheeks. For me, it has been really difficult to accept it. A few months ago, I couldn't even leave my house without makeup. Treatment is helping me a lot. I have had rosacea for about fourteen years now. Nothing gets rid of the redness and the bumps except antibiotics and I want nothing to do with that. I had tried a Tata Harper face oil and hated it. It made my rosacea worse. I now use (only) the Made from Earth rosehip hibiscus serum. I didn't notice much the night I put it on but the next day my skin looked clearer and less red. The day after that my redness and skin bumps were almost nonexistent. Putting makeup on made me look ten years younger (I'm 37) and I didn't even have to use concealer on what are normally terrible hereditary dark circles under my eyes. My creatinine level is 2.11, and other parameters are within limits. I am under the care of a nephrologist for my chronic kidney disease. I am feeling acute body pain every day morning, and in addition pain in feet. My wife has had hemorrhoids since she gave birth 22 years ago. They usually go back to where they came from, but this time they seem to be a little bigger and more painful. I have seen numerous doctors for rosacea. Two years ago I was told that I had a possible staph infection on my face. After months it healed and left me with large scars on my cheek and nose. Then I broke out with cystic acne. I had my intrauterine device (IUD) Mirena removed and that went away. Last summer I was diagnosed with idiopathic hives. I still have them. Five months ago I was diagnosed with rosacea. My face continually gets worse. During my initial treatment for the hives I was on 80 mg a day of prednisone. I'm not sure that has anything to do with it, but my face burns/itches constantly. My eyelids swell and my eyes burn frequently. Doctors just keep moving me from doctor to doctor, all the while I feel like my skin is falling apart. I don't hang out with people anymore. I am a 32 year old single mother of an autistic son who is now afraid to leave the house except for work. Even there people treat me poorly because I look like I don't try to take care of myself with my pizza face skin. Antibiotics orally have minimally helped but my 'new' doctor has hesitated putting me on them. I'm also on enough antihistamine to drop an elephant. I'm tired frequently. I am going to try attempt number 3 at gluten/dairy free diet, with reduced sugars. Hopefully this will help. When I have tried it in the past it actually did have moderate results in relieving my symptoms. Good luck to all of you. Rosacea gave me red veins on the face and purple blisters (pustules), neither of which can really be disguised at all by any foundation cream. Also, if you stand under a UV light, you look like a horror show. Just really, really ugly skin and I must admit, it's depressing. Regardless of age, it's hard to pretend that this does not matter; it does matter! I was diagnosed with rosacea when I was in my late 30s and struggling with it now more than ever in my 50s. It was sort of under control for a while because I was seeing a dermatologist, but now since I lost my job and have no health insurance my face looks like a big, old tomato. Every time I go for an interview I can't stop thinking about my face, and my own aunt said to me recently “how are you going to get a job with your face looking like that!” I can't go for another interview until I get this cleared up and really nothing over the counter works. We can send people up in space but we can't help people with this condition to make it easier on us, and make it easier to acquire medicines for this. I have recently developed Rosacea in the last 2-3 years. I am 47 years old and I am very embarrassed by it. Acne is one of my symptoms. I feel like I am 12. My adult children have looked at me and said Mom what is wrong with your face. I did see a dermatologist for the first time in my life. It seems it is trial and error and very expensive. I have an HSA and pay for it all. They will only prescribe for 3 months at a time so you have to keep paying office visits. Nothing is really working to clear it up. I was reading online one evening and read something about digestive enzymes. It triggered a thought in my head. I had my gallbladder out 3.5 years ago. Wow that was shortly before the rosacea started. My digestive system has certainly changed with having no Gallbladder now. I am going to seek the help of a Homeopath. I used to see a nature path who retired. My guess is it will be worth the money. Once again not covered by insurance. I have had rosacea for 15 years, and it's getting worse. I have used Metronidazole topical gel for years, and now it doesn't seem to be working at all. I was diagnosed with diabetes a year ago and take Metformin and now thyroid medication. I'm 60, and I look as if a have a bad case of acne and large veins on my cheeks. I look terrible. I experienced burning, an oily face with dirt, headache, eye irritation, red-hot facial skin, and sometimes red bumps. 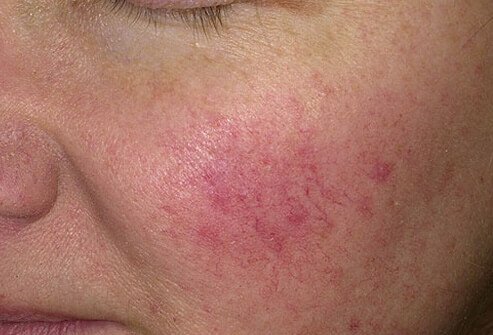 Red face, Visible capillaries, flushing, dry, irritated eyes, cyst type lumps and pimples most of the time. I have suffered from Rosacea for around 20 years but did not know the problem for a long time. At 60 it is finally under control. IPL performed by a reputable doctor will remove visible capillaries and background redness and you don't flush much at all. A glycolic acid cleanser helps keep pores clear, thus minimises blockages and lumps and bumps. Antibiotic gel (Eryacne) and a Vitamin A cream (Retrieve or Stieva) helps a lot with blemishes and clearing them quickly. Moisturisers with Hyaluronic Acid and MSM are marvellous as they look after dehydration and inflammation. Supplements of EFA's, Cod liver oil with A & d, Zinc, Vit. E (mixed tocotrienols best) Vit C, MSM will all help from the inside out. Cod Liver oil also helps with the eye irritation of Ocular Rosacea. Walnuts and peanuts really seem to make my rosacea flare up. I have it only on my right cheek area. First thought it was just acne, but it would never go away. Flares up and then gets much better, but always there. My sister says it is rosacea, and she may be right. I thought some have it all over their face. I have never experienced rosacea on my face but after consulting a doctor for rashes on my back and sides, had been diagnosed as the same condition. I have had this for a few years without any luck curing it. Just wanted to say that I had the best advice for rosacea and my skin has not been better. No soap for sure!! I also drink green tea everyday. It is like a miracle. My own tip is to use babywipes to wash your face. My skin is 150% better. With my rosacea, I experienced apple-colored cheeks, nose and jaw line. It was more predominant on the right side. Have you noticed any triggers for your rosacea? Which foods do you avoid, and which foods help your skin?